New Delhi– India is passing through the biggest technological revolution which will make data analytics critical for delivery of services to the people, NITI Aayog CEO Amitabh Kant said on Thursday. Leakages in government schemes are now vanishing and in due course all benefits provided by the government will go straight to the intended beneficiary’s account, he said at an event here. Addressing an interactive meeting organised by industry body FICCI, Kant enumerated the various initiatives of the government to change the 19th century mindsets and move into the 21st century through vast and transformative decisions. 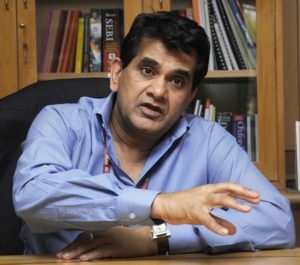 The government has leveraged technology to link up all states with the Centre through ‘PRAGATI’ (Pro-Active Governance and Timely Implementation), an integrative and interactive platform for addressing the common man’s grievances and monitoring important programmes and projects, the NITI Aayog CEO said. Under this initiative, the Prime Minister links up with all Chief Secretaries of states and Indian Ambassadors overseas to monitor projects online once every fortnight. This initiative, he added, was breaking all walls between the states and the Centre. He said the government has moved away from inputs and processes to focus on outcome targets of various ministries. Outcomes are now monitored regularly through a dashboard, an IT user interface, created by NITI Aayog. Any deviations from the assigned outcome targets are brought to the notice of the PMO, which then suggests appropriate remedial steps, Kant said at the interactive meeting on “The Business of Government: Learnings from Global Experiences” organised with the support of NITI Aayog, Bharti Institute of Public Policy of Indian School of Business (ISB) and the IBM Centre for The Business of Government.